She married Eric William SHARP. [S190] Index - GRO and Office of National Statistics, England & Wales Civil Registration Qtrly Indexes, Death: District of Swansea, Vol 11a, p1016, 4Q1932, aged 44. [S190] Index - GRO and Office of National Statistics, England & Wales Civil Registration Qtrly Indexes, Birth: District of Brentford, Vol 3a, p188, 1Q1918. [S190] Index - GRO and Office of National Statistics, England & Wales Civil Registration Qtrly Indexes, Birth: District of Croydon, Vol 2e, p438, 1Q1919. 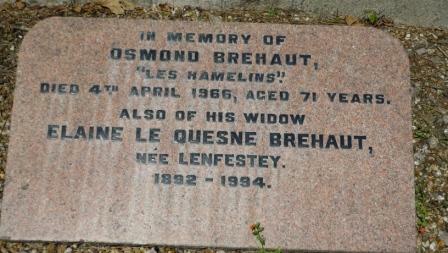 Edmond died circa 1990 in St Pierre-du-Bois, Guernsey, Channel Islands. [S541] National Archives of Britain, at http://www.nationalarchives.gov.uk, WWI Service Medal and Award Rolls, WO 329-120. Elaine died in 1994 in St Pierre-du-Bois, Guernsey, Channel Islands.1 She was buried at the Churchyard in St Pierre-du-Bois. 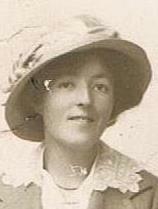 She married Wilfred Herbert SARRE, son of Peter James SARRE and Mary JEHAN, in Torteval, Guernsey, Channel Islands, on 3 January 1917. Estelle died on 22 February 1981 in St Peter Port, Guernsey, Channel Islands, at age 94.6,3 She was buried at the Cemetery in Torteval. [S1136] Photo - Guernsey families, #L20 LENFESTEY family and #S3 SARRE family, submitted by members #148, Mr & Mrs J.W.SARRE. 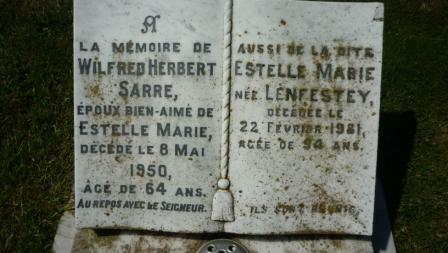 [S583] Cemetery Marker - Wilfred H Sarre / Estelle M LENFESTEY, Torteval cemetery, Guernsey. [S190] Index - GRO and Office of National Statistics, England & Wales Civil Registration Qtrly Indexes, Death: District of South Shields, Vol 10a, p681, 3Q1933, aged 43.